This picture was taken by Josh from the Viaduct in Seattle as we were driving home after spending Thanksgiving with family. 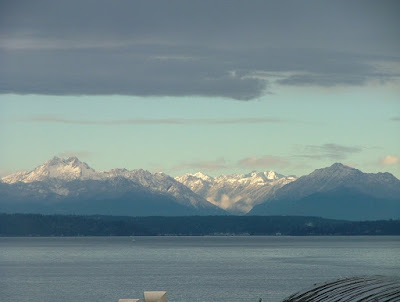 If you ever need to drive through Seattle, by-pass I-5 at about Sea-Tac airport and get yourself on state route 99, because you’ll see things like this – Elliot Bay, possibly with ferries; the Olympics, with snow, depending upon the season; and the best view of the Seattle skyline. Since moving to Seattle, I’ve become very attached to the Olympics, and in some ways, I like them better than the Cascades. They may not be as famous as the Cascades or Mt. Rainier, but they are just as beautiful.